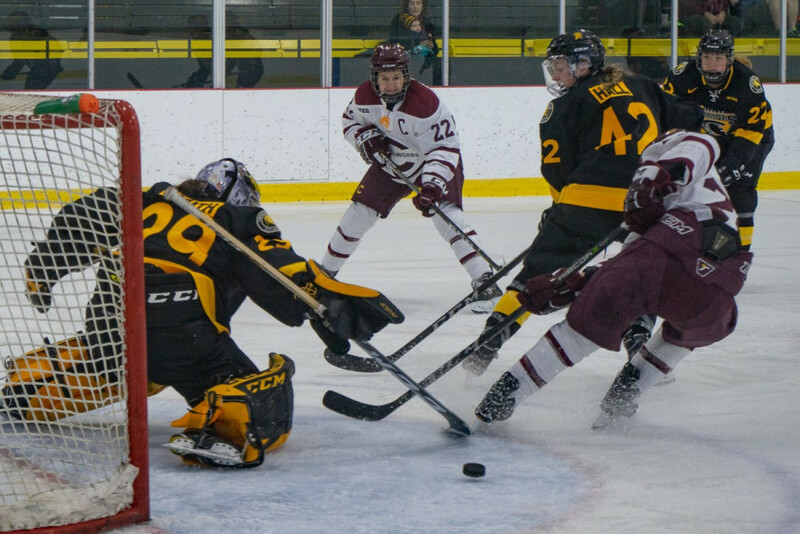 After two scoreless games, the Stingers managed to find the back of the net against the Carabins. Photo Elisa Barbier. 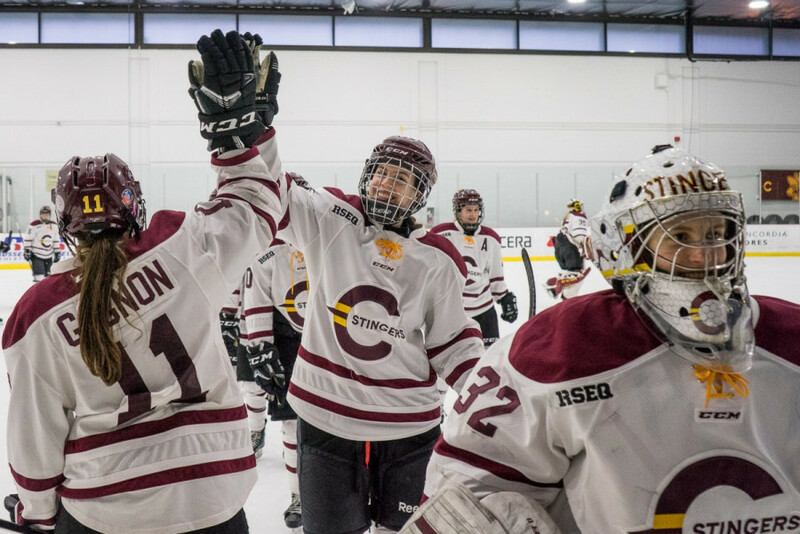 Coach Julie Chu’s squad had quite the challenge facing up against the number one team in the nation in the Université de Montréal Carabins. Scoring chances were scarce during the first period as most shots came from the perimeter. Both squads were pressing with a relentless forecheck in their opponent’s territory. The evenly matched first period ended with no one finding the back of the net. The shots were tied at eight following the first frame. The Carabins capitalized quickly to start the second period, just 22 seconds in. The open play in the second allowed Concordia to create better scoring chances, finally converting at 8:56 when forward Audrey Belzile managed to sneak a shot past Carabins goaltender Maude Trevian. The tally ended the defending RSEQ reigning champions’ offensive drought. The third-year veteran increased her scoring tally, leading the team in goals. Coach Chu praised her forward’s work ethic and determination. Belzile wouldn’t score again before the end of the second, but her work wasn’t done just yet. The Stingers came out a little flat-footed to start the last frame. Montreal was dominating the offensive possession and building up momentum. Goaltender Alice Philbert was stellar for the home side during this stretch. The second-year goaltender has been filling in for veteran Katherine Purchase. Philbert showed an impressive 1.67 goal against average after three games. The starter’s third period heroics allowed to receive the second star of the game as she concluded the game with 28 saves. The keeper was most satisfied with her performance, but remained humble after the game. Her incredible work was rewarded when Belzile connected with rookie Maria Manarolis for her first U Sports goal. The Stingers went into shutdown mode following their second goal. They never looked back and secured their second victory of the season. Concordia’s next matchup is Sunday, Nov. 4 at 3 p.m. at Ed Meagher. They will be facing a winless Carleton team.